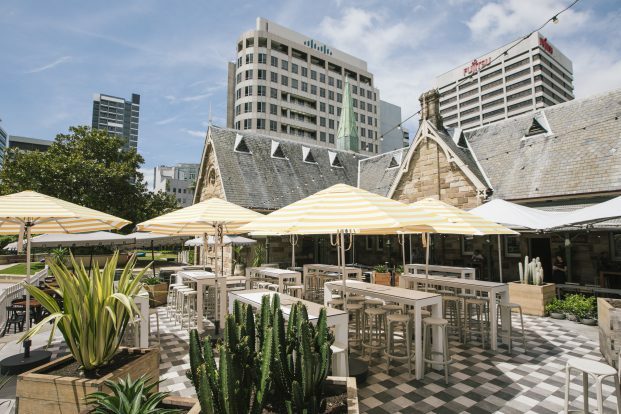 Tilley and Wills Hospitality Group – the hotel operator behind Verandah Bar and Restaurant in Sydney’s CBD, has reopened the iconic Greenwood in North Sydney after a refurb and spruce. Originally built in 1878 as a church and later used as a school, The Greenwood Hotel became a popular destination in 1992 when it was bought and turned into a pub. The venue has undergone a design overhaul by SJB Interiors that introduces fresh and earthy elements, with plantings of greenery and the introduction of indoor foliage. Landscape Designers “The Plant Room” worked with a custom steel fabricator to make some great lighting features for the interior wall and co-owner Nick Wills also commissioned Loose Leaf to create a sculptural piece in the Greenwood’s iconic Chapel Bar. “We wanted to use the existing architecture to build on the textures and then add colour and fun,” said co-owner Nick Wills, describing his approach to the refurbishment. “We found simple ways to complement the sandstone colour and make it pop with new greenery, outdoor furniture and plantings,” Wills said. Wills describes the overall renovation as seamlessly integrated. “The architecture of the original building is beautiful local sandstone with classic high, timber ceilings. The new design features throughout are intended to accentuate these features, rather than detract from the existing architecture. One of the major changes is that we have included a new external bar in the Northern Courtyard, which is great in terms of increasing efficiency, particularly during events and on the warmer summer days. Opening up the interior space and reinstating the natural light is also serving to draw more people to the interior spaces,” Wills said. 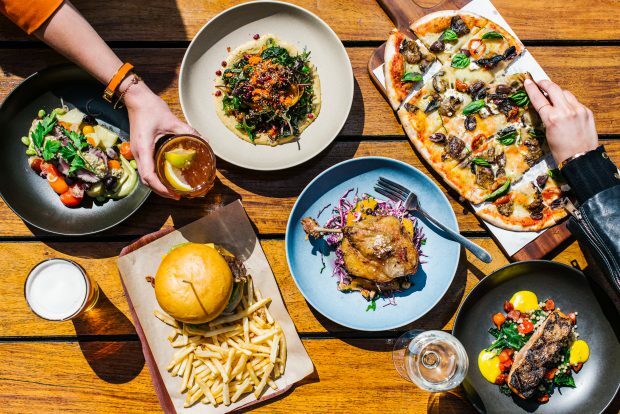 Inside the Greenwood bar and kitchen, the menu and drinks have also been refreshed by Group Executive Chef Brad Sloane and Head Chef Sam Matthews. Two new cocktails include the “Roll Call” and the “Aloe Vera Margarita”. The Roll Call puts a twist on a classic cosmopolitan, garnished with a fruit roll-up paying homage to the school Greenwood once was. By contrast the new margarita combines aloe vera, tequila and lime with a dash of honey, served in a salt rim glass. In the kitchen, traditional pub staples like burgers and beer-battered fish sit alongside healthy dishes, designed to entice locals who lunch. Matthews’ bright and light menu features salads such as the hummus super bowl with roast butternut, farro, broccolini, baby kale, carrot kraut, activated almonds with zaatar and vincotto dressing. The BBQ sesame chicken salad features a gluten-free combination of cucumber, bean sprouts, chilli, coriander, baby gem lettuce and crispy shallots with a roast sesame, ginger dressing. The Greenwood is currently nominated for two awards in the state’s 2018 AHA Awards for Excellence. Current nominations include; Best casual dining venue – North and Best promotional concept for their annual winter Snow Festival. Look out for a full Design & Build feature of The Greenwood Hotel in Australian Hotelier‘s November 2018 print edition.